Situated in central Kensington, the Royal Garden Hotel is minutes away from London's popular attractions. 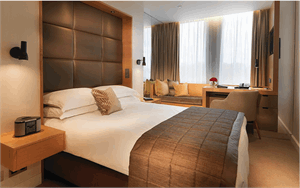 The rooms offer panoramic views of Kensington Palace and Gardens, Hyde Park or the city skyline. Savour some of the city's finest cuisine at the hotel's restaurants. NOTE: Queen Room is based on 1 Queen Room. King Room is based on 1 King Bed. Garden Room is based on 1 King Bed or 2 Single Beds. Executive Room is based on 1 King Bed or 2 Single Beds. *Saving of up to 28% is based on staying in a Queen Room and discounts are already included the price. PACKAGE TERMS & CONDITIONS: It is our policy to present the cost of our holidays inclusive of all airport and government charges. Please accept however that these charges are not within our control, therefore we reserve the right to pass on any increase.. Travel agent professional service fees where charged, will be additional to the advertised prices. Closeout and blackout periods apply over school holidays and peak holiday periods & availability of seats & rooms is likely to be very limited over this time . Valid for sales to 30 Apr 2019. Valid for travel commenced and completed within the period 7 Jan 2019 to 6 May 2019 (unless otherwise specified). *Saving of up to 28% is based on staying in a Queen Room and discounts are already included the price. Land only, airfares additional. Accommodation surcharges apply during Trade Fair periods. Twin bedding must be requested if required. Please note there is limited availability on the advertised room types and all pricing is subject to change until a reservation is confirmed. Inventory & availability can change on a daily basis. Strictly subject to availability for all components. Please enquire for an up to date price at the time of booking. Prices shown are based on per person costs in New Zealand Dollars, for payment by cash, cheque or eftpos only. Credit card sales not permitted unless Travel Agent acts as a merchant. Strict cancellation fees apply. Packages are based on consecutive nights. For split stays please contact your travel consultant. For full terms and conditions and cancellation fees please contact your local travel agent for more information. Trade enquiries via GO Holidays.